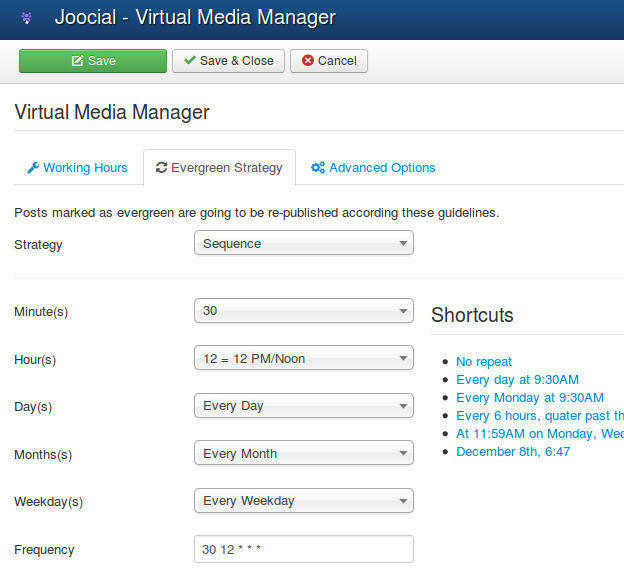 Joocial promotes the Social Management of your Content by creating and delivering messages from your own system. 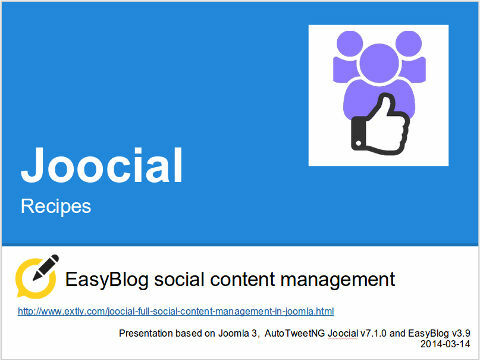 Simply, Joocial automatically posts your content to social networks + advanced content management. 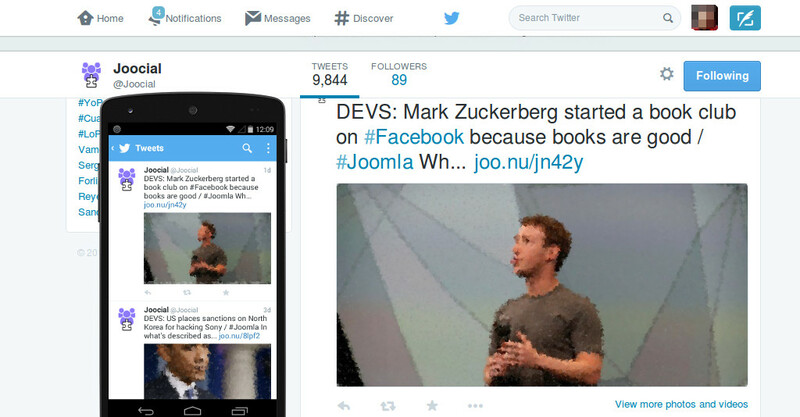 Joocial is the next stage of AutoTweet evolution, beyond simply auto-publishing content. Joocial speaks up for a unified content strategy in selection, creation, maintenance and distribution on the web. Social channels are integrated to publish rich messages from cohesive sources, in a timely manner, engaging your audience. 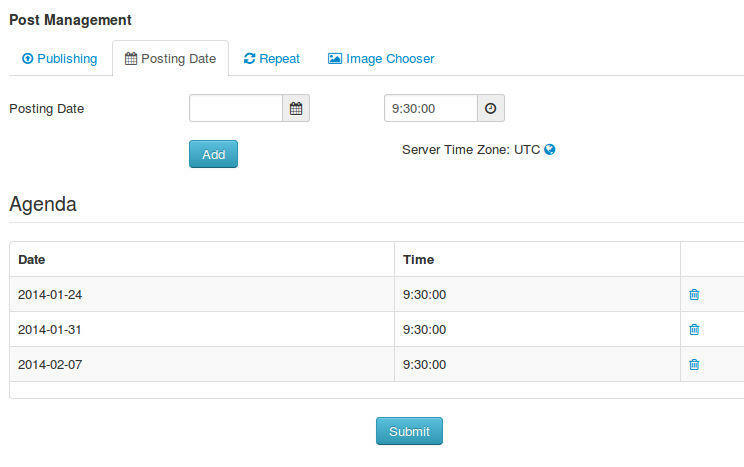 For starters, Auto Tweet NG PRO has a set of features for complete automated auto-posting. 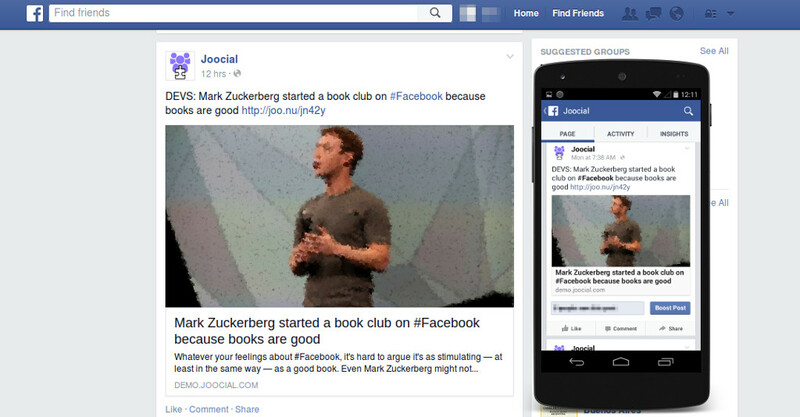 Joocial builds on this base to supply innovative features for state-of-the-art community management. AutoTweet is mainly oriented for unassisted auto-posting Just keep using Joomla! as usual, creating articles or other content items. 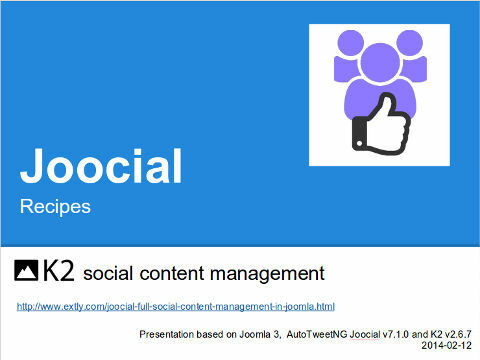 On the other hand, Joocial has all AutoTweet features plus advanced features for social management. For instance, Joocial has a "publishing agenda" to repeat Posts, or "working hours" to define when your audience is online. In a real life scenario, a publisher can create a new content item and define the social impact, associating media attributes. Joocial's basic configuration begins with the same steps than social auto-posting: multiple unlimited channels, requests and posts administration, rules, RSS feeds for article generation and integration with over 60+ Joomla! application extensions. 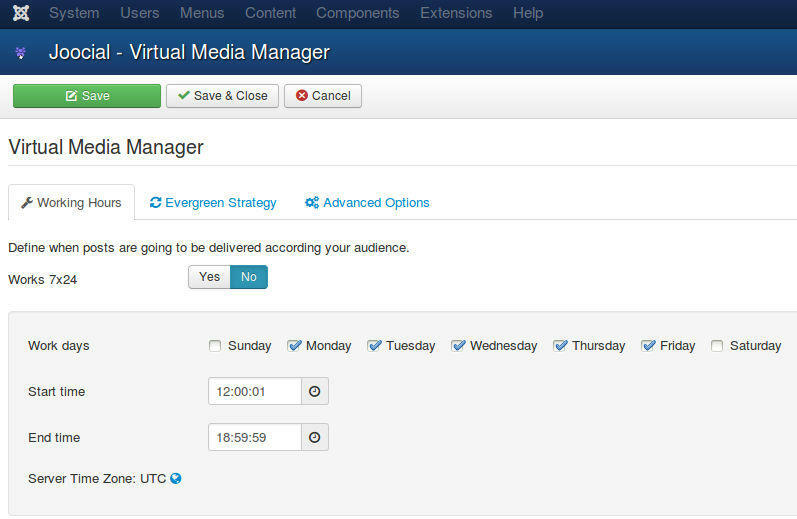 At this instance, Social Composer adds new dimensions to create precise messages according to the designed strategy: media manager, publishing attributes, channel selector, agenda and repeats. 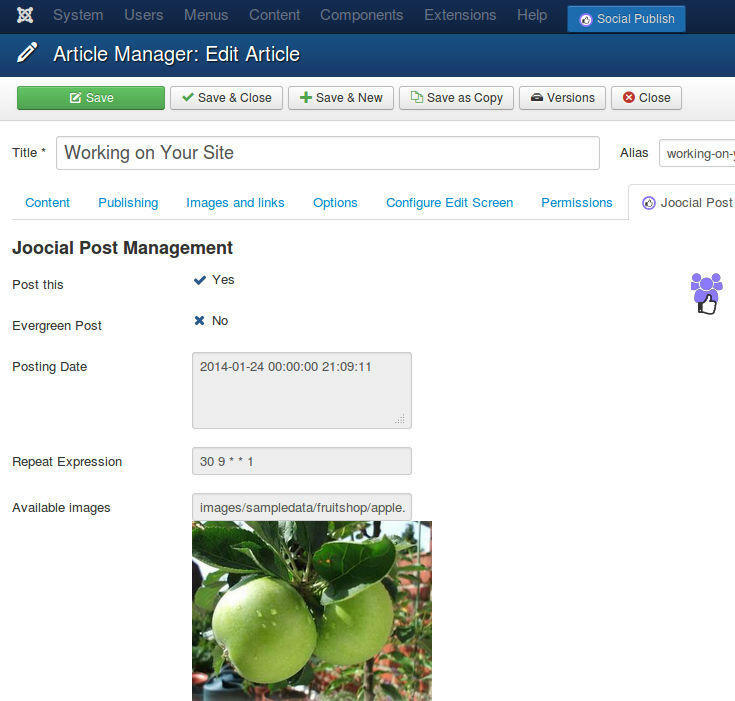 Social Publish toolbar and Editor button define social posting properties right in the integrated content source. High-level virtual assistant for managing when messages are published following a definite agenda or repeats, according to working hours. If there is no content to be published, the virtual assistant can retrieve and republish messages marked as evergreen, depending on frequency. Support of Web Push Channels, powered by OneSignal or Pushwoosh. Apart from the most popular social channels, Joocial provides complementary channels to increase exposure: Blogger, Tumblr, JomSocial, EasySocial, Telegram and Medium. Facebook Open Graph and TwitterCard support to automatically add content tags. The total user reviews for our social share family (Auto Tweet Free, AutoTweet NG Pro and Joocial) is 149! ...it does everything it promises and I very quickly got the operations of the component and there seems to be a lot of flexibility you can program/ configure into the way the social media channels take and report information from the site. The following screenshots have been generated from Joocial News demo site, capturing auto-published content in a desktop view and a mobile device view. As part of our social media management strategy, we operate the Joocial News demo site. This way, we have a perfect leading case to show what can be achieved creating a news site based on +20 RSS Feeds to distribute content messages to our social channels. 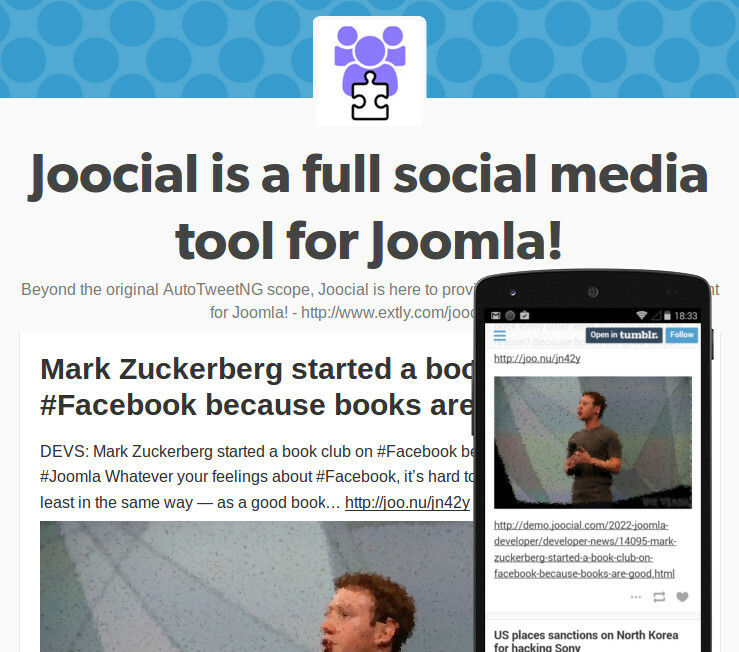 Joocial for Joomla! CMS is a real social media content management platform. 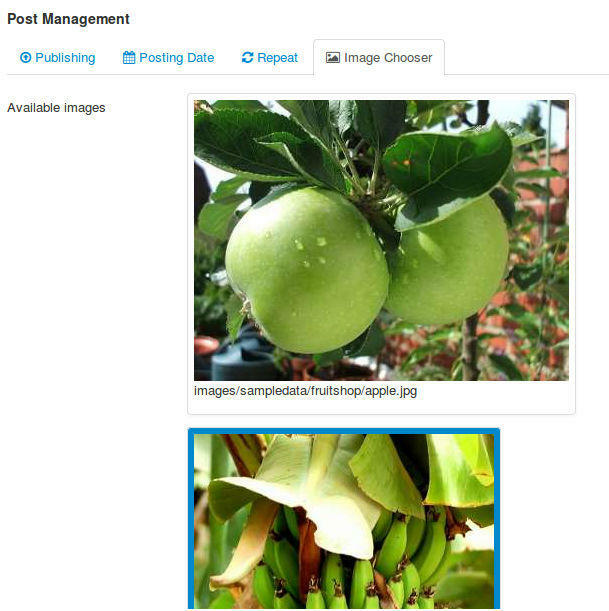 Beyond auto-posting content, Joocial introduces tools at component item level for defining specific properties. Integrated with Joomla Articles, EasyBlog, FlexiContent, JoomShopping, K2, SobiPro, Zoo, and more. Post Management Toolbar access is shown in all integrated components. 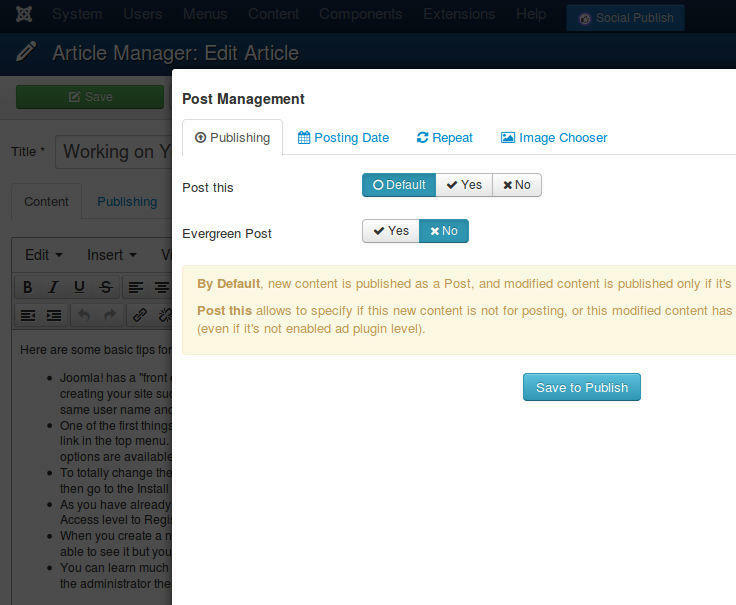 Post Management Editor Button access is shown in all integrated "content" components. Social publishing properties are shown in "content" items. Publishing Agenda: Schedule when the Post must be published, and a sequence of re-publications. Image Chooser: Select which article image must be included in Post. Evergreen Posts: Posts selected as evergreen can be posted if there’s no content available. In this form, you can define the frequency of evergreen posts. 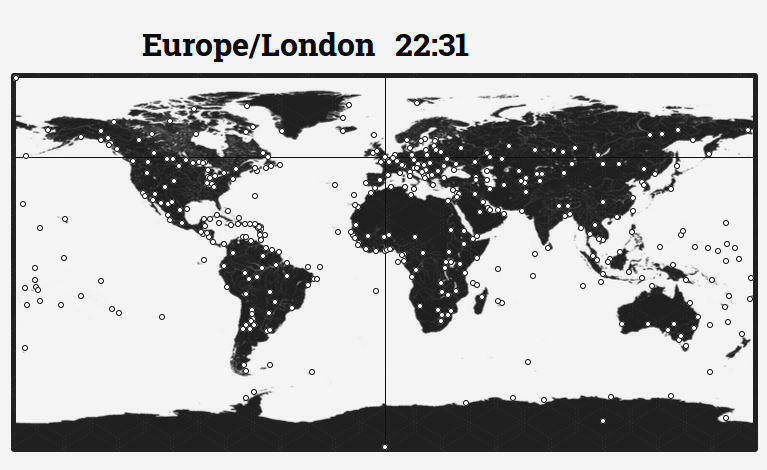 Working Hours: only publish in "working hours". Request Calendar View of scheduled messages. 5 stars - " Great Support "	by Graeme I am still getting to grips with the component it seems to do everything it promises and i very quickly got the operations of the of the component. and there seems to be a lot of flexibility you can program/ configure into the way the social media channels take and report information from the site. The Setting up is a little tricky mainly because of the external resources which need configuring, Fortunately the support team were brilliant at showing me the errors of my ways and helping to resolve issues created via the third party apps which need configuring with a lot of precision. Great Support what more can you say or want.